This review is for the third volume of Magical Girl Raising Project. This series is written by Asari Endou and features illustrations by Marui-no. The fourth volume is set to release July 17, 2018. There are 10 volumes in Japan at the moment, plus two side story volumes. Volume 3 is the second half of the “Restart” storyline begun by volume 2, which ended with a cliffhanger. This volume has the remaining magical girls working their way through some cyber dreamworld video game, hoping to escape by defeating a final boss known simply as the Evil King. Will it really be that simple though? And what does the mastermind behind this fearsome game intend to accomplish in all this? This is an odd book to review on its own, in that I imagine everyone who picked up volume 2 will definitely want to read volume 3. This is the second half of the story, and things can only get more exciting in the second half of a survival game, right? At any rate, I enjoyed reading through to the conclusion for this violent and tragic story arc. This book starts out with a bang, but then it’s slow going for a while as teams continue a gradual but steady progression through the game and various characters muse over their situation and investigate one another. It’s good to have some variety in a story’s pacing, but it did take a while for me to get re-invested in the remaining players. This isn’t really a series for character development, as much as it is for plot twists that reveal unexpected aspects to the characters. Eventually things pick up again by the final act of the book though, as the floodgates are opened regarding who committed the murders of the first volume and what the motivations behind them were. (I am rather pleased to say I made at least a couple correct guesses!) At the same time, things come to a head once the confrontation with the Evil King takes a clever and unexpected turn, and it’s repeatedly up in the air who will survive each violent encounter. The action is handled as well as in previous volumes, and it remains entertaining to see how the characters will use their special abilities in unorthodox ways. I found the character Clantail particularly fun; her ability to transform the lower half of her body into any animal provided plenty of possibilities for the author to work with. Personality-wise, my personal favorite remains Pfle, the ever-unflappable little manipulator. There are a few plot points in this volume I had mixed feelings on, however. Some plot developments were a stretch, and there was one reveal in particular (more of a non-reveal honestly) that I just felt meh about the whole book. (Said non-reveal was kind of spoiled for me beforehand by the way, which I suppose bummed me out a bit too.) Also, a lot of the plot beats in this were quite similar to a certain sequel for a certain game series I really like–which isn’t a huge deal, but it did affect my reading of this story. I won’t end on a negative note here though, because overall I did have a good time with this one, and I look forward to seeing where the series will go from here in future volumes. Raising Project is an exciting page-turner well-worth looking into if you’re in the mood for an action-packed story that does its own thing and isn’t afraid to put major characters in legitimately mortal peril. Which plot development do you think was a stretch? As for the reveal you mention about the participants , its possible to kind of predict it but not about it being all of them. Also you are quite correct about it being similar to the game you have mentioned as when i was reading that part that game came to my mind immediately. I liked how mastermind was beaten but i wish there was a bit more info about how she was dealt with. The mastermind wasn’t any of the characters we know… Just some other random magical girl, who didn’t turn out to be very interesting in general. Felt like a missed opportunity to me. Dangan Ronpa 2, right? I won’t say anymore in case you’re thinking of something else, but… yeah, I could write up a good list of similarities between MGRP Restart and this, ha ha. As for the series in Japan… I’m not certain what the situation is for it. From what I can tell on lndb.info, the series seems to have various story arcs, though some volumes look like side stories or short story compilations. I don’t know if the author ended at a good stopping point or not. At least it’s only been about a year and a half hiatus, rather than seven years. Game is correct. As for power reveals it felt like only Clantail was a stretch because it opens up a hell lot of possibilities in terms of using “animals” that are in the same realm of her last transformation. I wish we did see more of the mastermind but she was not the focus of the story imo , her game was. I thought this was a great conclusion to this story. The twists and everything that happens kept me on the edge of my seat. Particularly after a certain reveal for the entire cast, I could just not put it down. Certain things I was able to guess. The links to a particular girl from volume 1 seemed obvious back in volume 2, and I guessed the traitor(s), but the stuff with the Evil King was both great and unexpected. In fact, the very final stretch and especially that fight had me constantly questioning what would happen, and that particular reveal was a pretty great twist that linked things together very well for me. My favorite girls were probably @Meow-Meow and Nonako. I was also partial to Shadow Gale and Clantail, but on the whole I enjoyed most of the characters. The stuff with the powers didn’t so much bug me. Snow White kind of showed that the powers can evolve and become better as more time goes on. Actually, there were maybe 2 moments that felt slightly iffy to me, but not so much that they bothered me too much. Honestly, if your non-reveal complaint is mastermind related, I agree. I don’t think they even said her name in the story, but I did kind of end up liking how she was dealt with… Although I felt there were some missed opportunities with her. I’d also agree that this series is far better about developing the stories and twists than the characters to a certain degree. Some characters get great moments, and some don’t really get as much as I’d like. Although from what I gather from the afterword and seeing a couple of the titles for the series, the author occasionally puts out “Episodes” novels that develop more of the girls in short stories, which I’m for. Magical Girl Raising Project has really become one of my favorite light novels out there right now. 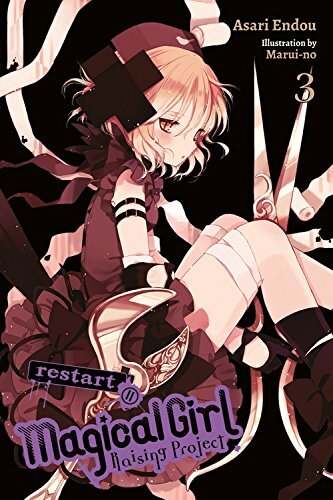 I enjoyed the anime and then the first novel, but Restart was a huge leap up for me. Easily one of the series I am looking forward to the most for each new release. Thanks for the comment, lazyproblems! I found the book quite exciting as well, and felt that final battle was perhaps its standout scene. MGRP uses its premise to its advantage well in such scenes, in that you can’t be sure who–if anyone–is going to get out of all this alive. I’m looking forward to the side stories novel coming out soon, which should flesh out some of the characters a bit more.